Today, when Turkish Prime Minister Erdogan said he would “eradicate Twitter” and blocked access to its site, we saw the power of citizen journalism at work. Our Larry Press reports. aNewDomain.net — I gave my class a presentation on citizen journalism yesterday. The timing couldn’t have been better. 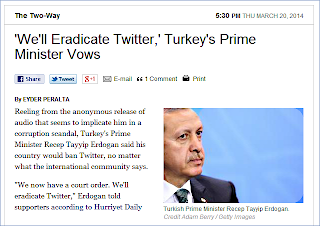 Today, when Turkish Prime Minister Erdogan declared his intention to “eradicate Twitter” and went on to block access to its site, the result was a classic example of the power of citizen journalism. The futility of that act became apparent quickly — Twitter and others published technical tips showing how Turks could continue using Twitter — and they did. Politicians — the president of Turkey, the mayor of Ankara, and the vice-president of the EU commission — also spoke out against the move by Erdogan. As the saying goes — the Net routes around damage. 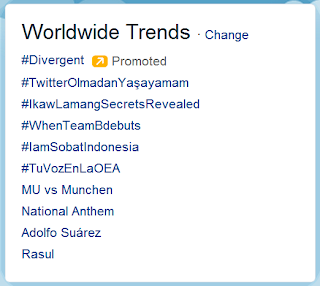 The hashtag #TwitterOlmadanYasayamam (I can’t live without Twitter) soon rose to the top of Twitter’s worldwide trending topics. Internet-based citizen journalism has played a role in politics for nearly a quarter of a century, but both bad guys and good guys use citizen journalism as a political tool. I may be naive, but when historians look back years from now, I think the good guys will have won. Based in Los Angeles, Larry Press is a founding senior editor covering tech here ataNewDomain.net. He’s also a professor of information systems at California State University at Dominguez Hills. 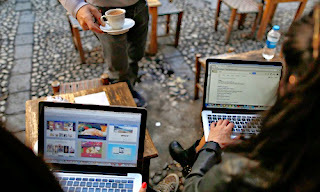 Check his Google+ profile — he’s at +Larry Press — or email him at Larry@aNewDomain.net.